New York Times columnist Tom Friedman began his Sunday column (June 6) with a vintage Friedman response to the murderous Israeli assault on the Mavi Marmara. The assault that lead to the deaths of nine men on the Mavi Marmara was, for Friedman, a “sideshow” to the real “ball game”, the creation of a “two state” solution. Friedman’s column demands a closer examination. 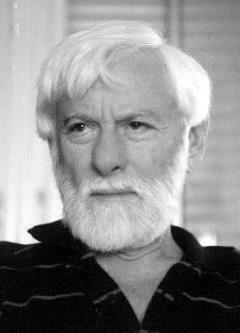 Beyond Freeman, there are other voices to which attention must be paid: Israeli peace veteran Uri Avenry, Canadian author Margaret Atwood, and Senator John Kerry (D-MA). Friedman’s reaction to the attacks on the Gaza-bound Flotilla opens with a return to his days as a young foreign correspondent. When I covered the 1982 Lebanon war, I learned something surprising about wars: they attract all kinds of spectators, meddlers, do-gooders and do-badders. They use the conflict and the attention it generates to play out their own identity issues, passions and biases. My favorite in Beirut was a gentleman who showed up in August 1982 as the Palestinian guerrillas were sailing out of Beirut harbor. His name — I am not making this up — was Arthur Blessitt, the “Sunset Boulevard Preacher.” He had walked to West Beirut from Israel to pray for peace, dragging a 13-foot-long wooden cross with a little wheel on the bottom. Arthur was harmless; some of the others, though, were mendacious, which prompted me to promulgate this rule: I adore the Israelis and Palestinians, but God save me from some of their European and American friends. Their grandstanding interventions — like those blockade-busters sailing to Gaza or the wealthy American Jews who fund extremist settlers’ housing purchases in Arab East Jerusalem — often fuel the worst trends on either side and divert our energies from the only thing that is important: forging a two-state solution. . . .
By bringing Arthur Blessitt back on stage in his historical drama, Friedman takes a swipe at a Christian “preacher” from 1982 who was so out of touch with reality that he thought nothing of dragging a cross, a 13-foot-long wooden cross, from Israel to Beruit. Isn’t that a ridiculous image to contemplate? Surely, Friedman is not hinting that this wierdo from California is putting on his own Passion Play. Surely, Friedman would not make fun of a moment in Christian history which is sacred to Christian believers everywhere. Would he? Friedman chose to ignore the presence of a second ship in the Gaza-bound convoy, which was later boarded without incident and hauled to the Israeli port of Ashdod. That ship was the Rachel Corrie, named quite aptly in memory of the 23-year-old American volunteer Rachel Corrie, who was run over and murdered in Gaza by a Caterpiller bulldozer in 2003. The idea of a flotilla as a means to break the blockade borders on genius. It placed the Israeli government on the horns of a dilemma – the choice between several alternatives, all of them bad. Every general hopes to get his opponent into such a situation. 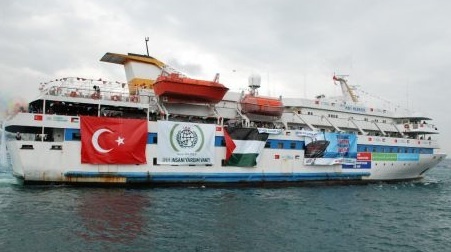 To let the flotilla reach Gaza without hindrance. The cabinet secretary supported this option. That would have led to the end of the blockade, because after this flotilla more and larger ones would have come. To stop the ships in territorial waters, inspect their cargo and make sure they were not carrying weapons or “terrorists”, then let them continue on their way. That would have aroused some vague protests in the world but upheld the principle of a blockade. To capture them on the high seas and bring them to Ashdod, risking a face-to-face battle with activists on board. Ha’aretz, the moderate Jerusalem newspaper, asked Canadian poet and writer Margaret Atwood to write on the current political situation in Israel out of her own background as a novelist and literary theorist. In May of this year, Atwood was honored with Israel’s $1,000,000 Dan David Prize, which she shared with Indian author Amitav Ghosh, at Tel Aviv University. The Palestinian Campaign for the Academic and Cultural Boycott of Israel (PACBI) had asked Atwood to boycott the award. It was PACBI that persuaded Elvis Costello to cancel his scheduled trip to Israel. Atwood refused to cancel. She told the PACBI ,”we don’t do cultural boycotts”. Her refusal was a setback for the Palestinian boycott campaign, but her recent visit to the country led to the invitation to write for Ha’aretz. The timing could not have been better. Atwood, the author of 40 books, is a major Canadian poet, critic, essayist, and novelist. One of her best known novels is The Handmaid’s Tale, published in 1986. 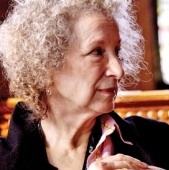 In 1987, Janet Karsten Larson wrote an essay on The Handmaid’s Tale for the Christian Century magazine, Margaret Atwood’s Testaments: Resisting the Gilead Within. Larson described Atwood’s ability to connect literature, politics, and human survival. Since 1972, when Atwood published Survival, a critical study of her own national literature, and Surfacing, a novel about a woman’s recovery of identity, this powerful writer has been acclaimed for her canny exposures of sexual politics and modes of human survival. The novel is a dystopian vision of a future in which Christian fundamentalists have executed the President, machine-gunned the Congress (blaming the assassinations on Muslim fanatics), suspended the constitution, and created a new social order in which women are, at best, commodities. . . . there is a continual state of war, and sectors run by the fundamentalists have been rechristened the Republic of Gilead. Recently I was in Israel. The Israelis I met could not have been more welcoming. I saw many impressive accomplishments and creative projects, and talked with many different people. The sun was shining, the waves waving, the flowers were in bloom. Tourists jogged along the beach at Tel Aviv as if everything was normal. But… there was the Shadow. Why was everything trembling a little, like a mirage? Was it like that moment before a tsunami when the birds fly to the treetops and the animals head for the hills because they can feel it coming? “Every morning I wake up in fear,” someone told me. “That’s just self-pity, to excuse what’s happening,” said someone else. Of course, fear and self-pity can both be real. It haunts everything. The Shadow is not the Palestinians. The Shadow is Israel’s treatment of the Palestinians, linked with Israeli’s own fears. The worse the Palestinians are treated in the name of those fears, the bigger the Shadow grows, and then the fears grow with them; and the justifications for the treatment multiply. The attempts to shut down criticism are ominous, as is the language being used. Once you start calling other people by vermin names such as “vipers,” you imply their extermination. To name just one example, such labels were applied wholesale to the Tutsis months before the Rwanda massacre began. Studies have shown that ordinary people can be led to commit horrors if told they’ll be acting in self-defense, for “victory,” or to benefit mankind. . . . The response from members of the US Congress to Israel’s attacks on the relief convoy, was consistent with the views of one of the Senate’s most respected members, John Kerry, Democrat from Massachusetts. There is no consensus in these four views on the assault: A New York Times columnist, a veteran Israeli peace leader, a novelist, and an American politician, three shapers of opinion, and one US political decision maker. Which one holds the most power? The picture from the Flottila is from Free Gaza. Orwell wrote: ““Political language. . . is designed to make lies sound truthful and murder respectable, and to give an appearance of solidity to pure wind.” No need to say more about Congress’ collective reaction to the flotilla attack or to the siege of Gaza. 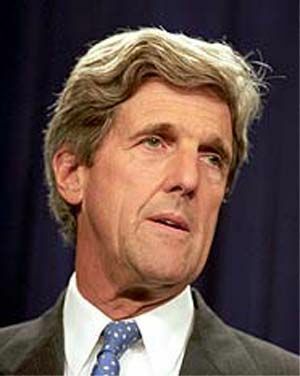 While Friedman may be more erudite than Kerry, the effect is the same; sounding reasonable, sounding peaceful, sounding objective, while in actuality advocating death by incrementalism (an obsession with security and institution building) and ignoring the basic truth of the unconscionable and unsuccessful imprisonment of 1.4 million people. Atwood redeemed herself with her great insight and writing. I was so disappointed when she accepted the million dollar prize in Tel Aviv but when i read her piece in Ha’aretz, i thought “Ah! This is why she went.” Now she is engaged and her blinders are off. Let’s see if that million dollars burns a hole in her pocket. The above people are making nice, disregarding Israel’s monstrous cruelty to Palestinians (demolishing houses, stealing land, stealing olive trees to replant in Israel, preventing women in labor, sick people, students, and workers from passage at checkpoints, allowing settlers to spread poison pellets to kill Palestinian sheep, poison wells, steal their olives, and burn their crops at harvest time, torturing Palestinians for the first three days they are arrested, arresting peaceful, unarmed protesters, keeping Muslims from worshipping in Jerusalem, and more.) Don’t ever wonder why the Arab world is angry at us. Defending Israel and unconditionally supporting its cruelty with our money puts us all in danger. The Zionist lobby is doing more harm to this nation than Americans can ever imagine. gaza regularly since 1981, under the auspices of St. George’s College and Sabeel. Not only do I have a good knowledge of the background and formation of the State if Israel. I have seen the steady increase of settlements, check points and all the other harassments that have taken place against the Palestinians. The conditions in Gaza were bad enough before the blockade. Since the destruction there in 2009, they are intolerable. I applaud the bravery and dedication of those trying to break the blockade and bring relief, and point up to the world just what Israel is doing to the Gazans (let alone East Jerusalem Palestinians, etc.) I pray the USA will finally take a stand against all international illegalities Israel has perpetrated through the years, and I would certainly vote to withhold military aid to Israel at this time, who, thanks to us, are overly well equipped with a huge nuclear arsenal as well.